A simple table listing the number of products sold in each store. Uh oh! 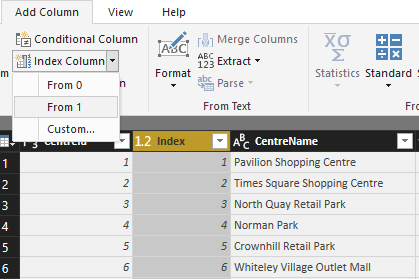 Turns out that there are several centres called Arndale Centre - Power BI has grouped the sales to centres of the same name. Each centre has its own row in the table, so we can check if the same name appears multiple times. Make sure to un-aggregate the column by choosing Don't Summarize, otherwise Power BI will try to SUM or COUNT it. The Edit Queries button on the Home tab. We could do a similar thing by using the RAND or RANDBETWEEN functions in a calculated column. It is never recommended to use From 0 unless you have a good reason to do so! Remember to change the aggregation to Don't Summarize, or all your hard work will be for naught! You will need to turn Word wrap off for both the Column headers and Values, or risk getting really long column headers!